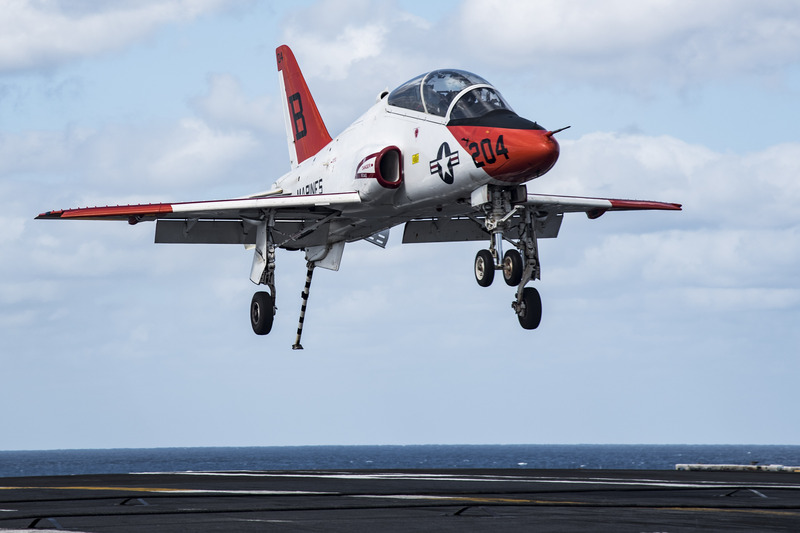 Navy student pilots will resume some flights in the T-45C Goshawk this week after a 12-day operational pause to determine the cause of recent oxygen-generation system failures, but they will not be allowed to land on aircraft carriers or fly higher-altitude missions until a permanent solution is found. Commander of Naval Air Forces Vice Adm. Mike Shoemaker ordered an initial three-day operational pause on April 5 after increasing concerns that pilots in the two-seat jet trainer may be at risk of hypoxia due to problems with the On Board Oxygen Generator System (OBOGS). That pause was extended as engineers struggled to determine the cause of the OBOGS failure, which Naval Air Forces spokeswoman Cmdr. Jeannie Groeneveld told USNI News is unrelated to the OBOGS failures and other physiological episodes (PEs) experienced in the rest of the Navy’s jet fleet. Groeneveld said that about 75 percent of the PEs that occur in the F/A-18A-D Hornets, F/A-18E-F Super Hornets and EA-18G Growlers have to do with cabin pressure problems from the Environmental Control System (ECS), and the remaining 25 percent are due to OBOGS. Two key factors with F-18 OBOGS failures have helped the Navy continue operating those aircraft, though: first, she said, the OBOGS system on the F-18s has consistently lit up an indicator light to tell pilots there is an issue before they start to feel sick, allowing the pilot to grab an “O-ring” bottle of pure oxygen to breathe from, which gives about 10 minutes to find a safe place to land. And secondly, once the pilots begin breathing from the O-ring, any symptoms of hypoxia – headache, tingly fingers, grogginess – have subsided. With the T-45C, Groeneveld said “in every case in the T-45 we weren’t always getting an indicator light” from the OBOGS – which is not identical to the OBOGS found on the other jets. Additionally, if pilots began feeling sick and grabbed the bottled oxygen, their symptoms did not immediately subside. Engineers have still not determined what the problem is, she said, though three T-45s involved in recent PEs are currently at Naval Air Station Patuxent River, Md., to be studied. One is having its OBOGS completely disassembled to look for clues, and the other two are undergoing a process similar to a mishap investigation. Until the engineers discover what is wrong and learn how to fix it, T-45 instructor and student pilots will not be using OBOGS during flights. A modified mask completely detaches them from the system and allows them to get back in the air for about 75 percent of their mission set, though Groeneveld said they could not land on aircraft carriers or exceed 10,000 feet cabin pressure without OBOGS. “This is a temporary mitigation measure to get them back to some of their flights,” she said. 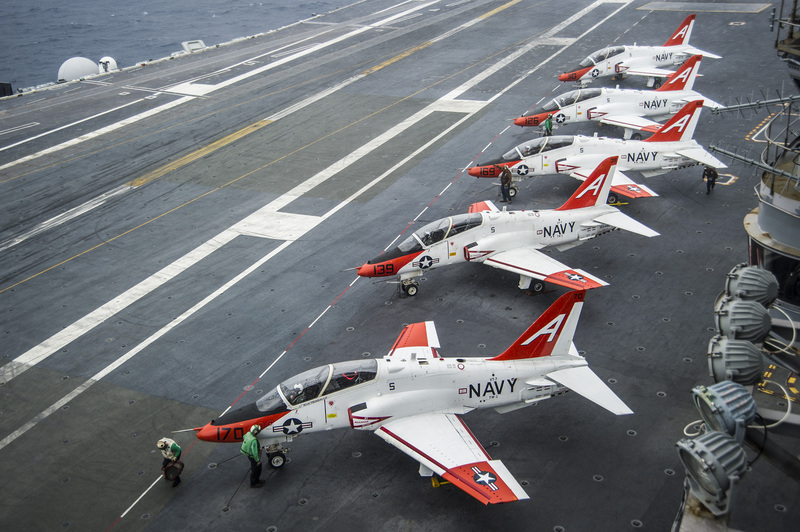 On March 31, “94 flights were canceled between Naval Air Stations Kingsville, Meridian and Pensacola due to operational risk management (ORM) concerns raised by T-45C instructor pilots. Their concerns are over recent physiological episodes experienced in the cockpit that was caused by contamination of the aircraft’s Onboard Oxygen Generation System (OBOGS). Chief of Naval Air Training (CNATRA) immediately requested the engineering experts at NAVAIR conduct in-person briefs with the pilots,” according to an April 5 Navy news release. Those briefings took place on April 3 and 4 ahead of the April 5 operational pause announcement. Shoemaker visited the three locations on April 6 to 8 to meet with instructor and student pilots, hear their concerns and share with them the Navy’s latest efforts to address the physiological episodes problem, which has been increasing across the Navy’s jet fleet since at least 2010. “After briefings and discussions with our aircrew, their training wing leadership, the engineers, and aeromedical experts, we have identified a way forward to resume flight operations safely by limiting the maximum cabin altitude to below 10,000 feet in order be able to operate without using the OBOGS system,” Shoemaker said in a Navy statement announcing the end of the operational pause. Beginning this week, instructor pilots will conduct warmup flights with the new masks and operating limits, after which they will brief the remaining pilots and students in their squadrons on the changes. As instructor pilots complete their warmups, warmups and training flights for student pilots will begin. “We have energized the force, are working with outside agencies, and established an Integrated Project Team (IPT) at NAVAIR, along with an aeromedical crisis action team of flight surgeons, physiologists and toxicologists. All teams are immersed in this effort and working with the same sense of urgency to solve our physiological episodes across the fleet,” Shoemaker said in the April 15 statement. A T-45C Goshawk training aircraft assigned to Carrier Training Wing (CTW) 2 makes an arrested landing aboard the aircraft carrier USS Dwight D. Eisenhower (CVN 69) on Feb. 11, 2017. US Navy photo. The Navy created a Physiological Episode Team (PET) in 2010 to look into what was then a rising trend in the F/A-18A-D Hornets and the F/A-18E-F Super Hornets, which has since spread to the EA-18G Growler and T-45C Goshawk fleets as well. During these PEs, pilots either receive insufficient oxygen or contaminated oxygen – leading to hypoxia – or experience a drop in cabin pressure, leading to decompression sickness. “Physiological Episodes (PEs) occur when aircrew experience a decrement in performance, related to disturbances in tissue oxygenation, depressurization or other factors present in the flight environment,” according to recent Navy testimony to the House Armed Services tactical air and land forces subcommittee. Shoemaker and others in the service have called finding a solution to the rising PE numbers a top priority for years and promised a “unconstrained resources” approach – offering whatever money or people were needed to find a solution. But the Navy’s testimony and other recent comments note the complexity in finding a root cause and a solution. Despite increased data collection since 2010, the Navy still doesn’t know what is causing these physiological events – but they are occurring at a growing rate. For legacy Hornets, PEs occurred at a rate of 3.66 per 100,000 flight hours during Fiscal Year 2006, according to historical flight data, as the Navy hadn’t started collecting PE data yet. In November 2010 through October 2011, that jumped to 10.9 PEs per 100,000 flight hours, and from November 2015 to October 2016, the Navy’s most recent data, pilots experienced 57.24 PEs per 100,000 flight hours. Similarly, on the Super Hornets, pilots saw 2.18 events per 100,000 hours in FY 2006, 8.65 from fall 2010 to fall 2011, and 31.05 from fall 2015 to fall 2016. On the Growlers, there were zero events until the fall of 2010; from the fall of 2010 until the fall of 2011 Growler pilots saw 5.52 events per 100,000 flight hours, and from the fall of 2015 to fall 2016 that figure spiked to 90.83 events per 100,000 hours. On the T-45C, data collection only began in 2012 but has increased from 11.86 events per 100,000 flight hours in calendar year 2012 to 46.97 events in 2016. “The process for investigating a physiological episode begins with the submission of data describing the event. 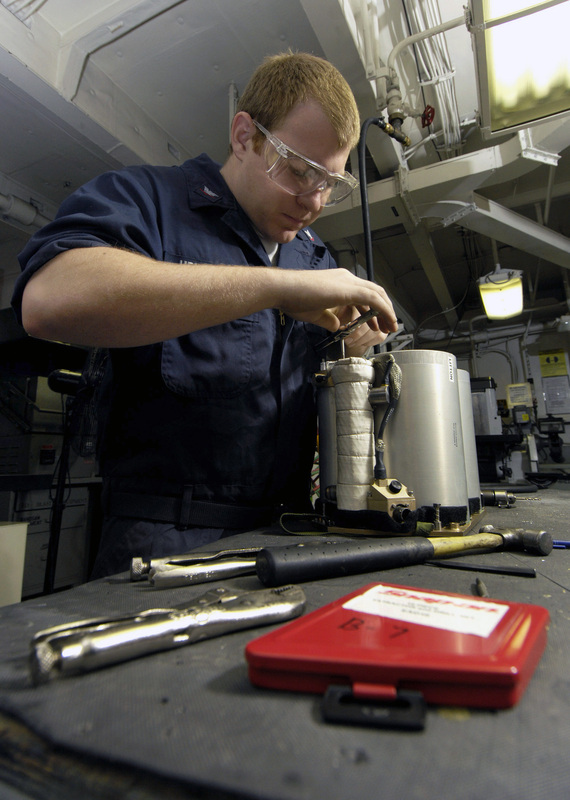 Engineers from the ECS FST and the Aircrew Oxygen Systems In-Service Support Center work with the squadron maintenance department to identify which components of the aircraft should be removed and submitted for engineering investigation. The squadron flight surgeon also submits data on the medical condition of the pilot and in-flight symptoms that were experienced,” according to the Navy’s recent testimony. The new modified mask and modified operational envelop for the T-45C pilots are the latest in a string of ideas to mitigate the risk to pilots, short of an actual solution. “Though the number of components and configurations of the aircraft make finding ‘smoking guns’ difficult, Naval Aviation has continued to implement multiple lines of effort across over the past couple years to mitigate the risks,” according to the April 8 news release. The new sieve material will be installed on all OBOGS systems in all jets by the end of the calendar year, with the T-45 fleet already having completed the installation of the new material. The Navy has also increased the intervals of inspections to improve the rate of detecting component failures before they lead to health hazards for pilots, and it has bought cockpit pressurization warning systems to field in the planes. “Our aviators must be able to operate with confidence in our platforms and in their ability to safely execute their mission. To help ensure we eliminate this risk, collection and reporting of event data and your continued leadership is critical,” Shoemaker said in the Navy statement. “We are working diligently to determine all the root causes of PEs and find solutions, and we will continue to aggressively prioritize resources and engineering efforts. Alert aircrew remains our best line of defense against PEs. Your awareness and immediate actions at the first signs of something ‘not quite right’ are critical, leading to safe aircraft recoveries and the identification of key causal factors. Please continue your focused simulator training, review of PE immediate action items at every brief, and maintenance efforts to identify ECS and OBOGS systems that are not performing to standard,” he continued in the memo.